A return to Morningside’s Church Hill Theatre for a second American High School Theatre show. Pippin is a fantastic example of a post-modern semi-surreal musical theatre. The show takes influence from the Italian Commedia Dell’arte which influenced everything from Shakespeare to the Pantomime. The basic principle is that characters are charicatured and slightly abserd. 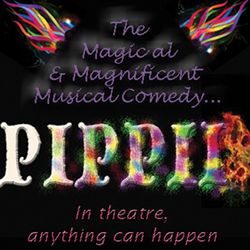 This is the case in Pippin, where the story is told by the performing company, and the journey of the central character takes him to meet a range of personalities. It is surprising how similar this seems to the Bernstein operetta Candide in content and physical style. What makes this show so brilliant is that it is very flexible. There are many smaller parts, so although some leads do have a heavy burden, the ensemble of secondary characters is large and varied. This makes it a surprisingly good choice for a High School Theatre group, as well as being capable of wowing audiences on Broadway by adding performers trained by Circ du Soleil. I really enjoyed the story which is simple, but gripping, and comes to a dark and challenging conclusion (which I won’t spoil, lest you are able to see this show some day). Every character Pippin meets on the way is colourful and entertaining – from his overly matcho brother (played in this cast by a female actor, which only added to the hilarity) to his dear batty grandmother. Although young, the cast, by-and-large, rose to the challenge of this show. Some vocal performances were perhaps a little too weak. The girl playing Fastrada struggled with the demanding songs and was unable to hold her pitch accurately at times, and the actress playing the grandmother was clearly very nervous despite her wonderfully entertaining acting. However, all of the cast threw themselves into the mood of the piece which was really the most important aspect in this show. Pippin is a fantastic show, and deserves to be remembered as part of musical theatre’s greatest. In particular, the nature of the piece makes it extraordinarily accessible for a wide range of theatre groups (I could imagine it would work well for mixed-ability theatre groups such as Chickenshed). The story is engaging and funny (the hallmarks of Mr Schwartz of Wicked fame) and the characters lively. One can only hope that the Tony Award for Best Revival-winning Broadway production is given a West End transfer and a long run in the UK. This entry was posted in Musicals, Reviews and tagged 4 stars, fringe 2013, musicals, reviews on 2nd September 2013 by .